Bruckner's career as a composer began with writing music for the church. Coming from humble rural origins, Bruckner would receive most of his musical education in monasteries, where he often worked as a teacher and organist. It wasn't until the composition of the Mass in D Minor (1864), written when the composer was 40, that we begin to glimpse what would become his mature style. 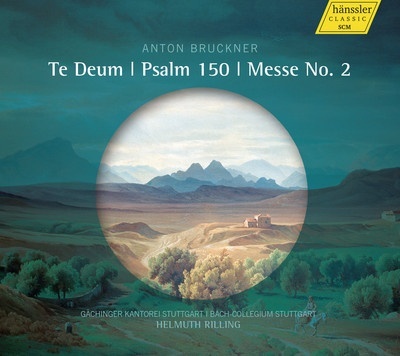 This CD brings together works from Bruckner's late period - the Mass in E minor, originally composed in 1866 is heard here in the revised version for choir and brass of 1882 - perhaps his most symphonic Mass of all. Also on the program is his setting of the 150th Psalm (1892). Written on commission for to provide a festive hymn to celebrate the opening of the exposition Internationale Ausstellung für Musik und Theatherwesen, it is one of his most important works, and as with the Te Deum (1884/85), an expansive and sonorous score. Helmuth Rilling leads his Bach-Collegium Stuttgart, the Gächinger choir and four outstanding soloists: Pamela Coburn, Ingeborg Danz, Christian Elsner and Hans-Josef Selig in moving performances of Bruckner's sacred works, bridging the gap between symphonic and sacred music, connecting these works both to the glorious traditions they sprang from to the bold new directions they would lead.